By adding a movie-rental feature to iTunes, Apple enters new territory for its online digital media store. Up until now, Apple CEO Steve Jobs has insisted that people who use iPods and iTunes are more interested in owning their content than renting it; it's because of that that iTunes enables users to buy individual tracks or albums that they can transfer to iPods or iPhones, play on their Mac or PC or burn to audio CD. That changes with the movie-rental service announced earlier this week at Macworld Expo. Now, when you go to the iTunes Store, you can rent movies, rather than buying them, just as if you were going to the corner video store. You can keep the downloaded rental for up to 30 days, though once you start watching it, you have 24 hours before it no longer will be viewable. But a different approach may be what Apple needs to bolster the movie business at iTunes. Full-length movies have been available for purchase at iTunes (at least in the U.S.) since September 2006. But they can cost anywhere from $9.99 to $14.99 for new releases—sometimes only a few dollars less than a DVD, with less content and with lower quality. Little wonder, then, that movie sales haven't caught on as Apple hoped they would, even though Apple says it has sold millions of movies since adding that feature to its store. Now, the same movie that once cost $14.99 to download—Pirates of the Caribbean: At World's End, say—is also available as a $3.99 rental. But is the experience worth the rental price? To find out, we went on a movie shopping spree. Right now, iTunes' rental library is considerably smaller than the catalog of movies available for purchase. But that should change quickly in the coming weeks—Apple expects to have 1,000 movies available for rent by the end of February. Paying for and downloading a movie is just as it was before, though there's now a new Rentals area in the Movies section of the iTunes Store, where you'll see the options you have for renting—as opposed to buying—a movie. As we published this article, the catalog fits on a single page in iTunes, and runs the gamut from recently-released action films like 300 to classics like Breakfast at Tiffany's, comedies, family films, and some offbeat fare like the ribald puppet movie from South Park's creators, Team America: World Police. Rentals cost $3.99 for new releases and $2.99 for older titles. Apple will also offer high-definition movies for download from the revamped Apple TV, but HD content won't be available until the new rental-enabled Apple TV software update is released; when it does appear, it will cost $4.99 to download new HD titles and $3.99 for older movies. As mentioned above, you have 30 days to start watching the rental, but once you start, you have a 24-hour window to finish watching before the rental expires. You'll need iTunes 7.6 to download rentals, as well as QuickTime 7.4—both software updates came out immediately after Jobs' keynote. To put the rental service through its paces, I rented the Bruce Willis action movie Live Free or Die Hard, a $3.99 rental. It took about 20 minutes to grab the 1.8GB file—the speed was the result of limited bandwidth at the hotel room I'm staying at for Expo, as opposed to any problem with iTunes. A faster home connection will easily result in faster download times. That's not to say the rental system is flawless—I first tried to grab Blades of Glory, the Will Ferrell comedy—for my troubles, I got a message that the movie's status had recently changed. Additionally, the actual timing mechanism seems a little wonky. When my download didn't finish Tuesday night, I started them up again Wednesday morning—I discovered that the 30-day clock had already started running, via a message that said I had 29 days to watch the movie. Perhaps the clock starts running because Apple contends you can begin watching the rentals within 30 seconds of starting the download on "a modern Internet connection," but it seems like it would be more fair to wait until the download was complete before beginning the 30-day countdown. When you make up your mind about what you want to grab, you're prompted by the iTunes Store to confirm your purchase—a good maneuver for someone who might have inadvertently clicked on the "Rent Movie" button without realizing what they were doing. And you have the option at this point to turn off that dialog box in the future, if you wish. Once you click on Rent, the movie transfers to your computer. Rented Movies appears between Movies and TV Shows in the Library section of the Source List. As the file transfers you'll notice a new icon in the Library section of the Source List—Rented Movies. Clicking on this icon reveals any movies that you've rented complete with information about the studio, the movie's run time, and a short synopsis describing what's going on. You have the option to watch the movie as soon as enough of the file has downloaded to build up a buffer. And when you double click on the movie to begin watching, you're advised that you'll have 24 hours to finish watching the movie. From there, the experience of watching the movie is the same as it would be if you'd bought it. Chapters are marked, you can make the movie player go full screen, and so on. You can also transfer your rental to another device—specifically, an iPod, iPhone, or Apple TV. Transfer is the operative word here—you are, in fact, moving a file from one device to another, not copying it. You'll need to be connected to the Internet to move files off your computer to allow iTunes to manage the FairPlay DRM transaction that makes this possible. Given how cumbersome managing files encrypted with DRM can be, Apple has been able to disguise the process to make it as unobtrusive as possible. Still, some users are likely to wonder why they have to move movies, rather than copy them as they do with music—and they're likely to find explanations involving movie studio concerns about piracy unsatisfying. When the 24-hour window closes, your movie rental disappears. When the transfer is complete, the copy of your movie disappears from the iTunes Rental Movies list on your computer and reappears on the device you've copied it to. Once the 24-hour window closes, your rental disappears from the Rental Movies list as well. 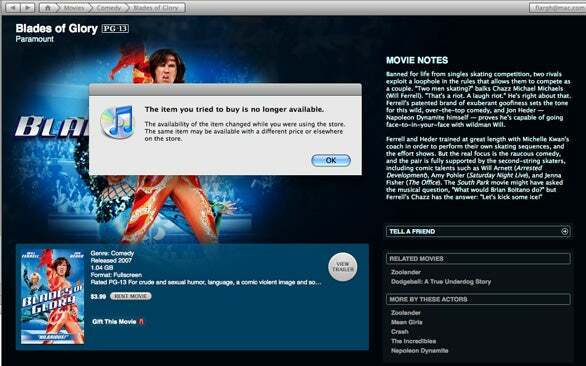 iTunes movie rentals are unlikely to appeal to everyone, particularly people who still prefer to own their media as well as others who have no qualms about taking what they can get via BitTorrent. But for those users who are more interested in an easy, straightforward way to download premium movies that can be watched on multiple devices without a return trip to the video store, iTunes rentals will fit the bill. Despite a few opening-day glitches, which Apple is likely to smooth out, the new service is surprisingly robust and easy to use.